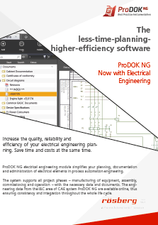 ProDOK NG is the I&C CAE system for the planning and operational support of I&C installations. Wherever ProDOK NG is used, rational, consistent project planning and consistent documentation are guaranteed. ProDOK NG ensures an integrated planning process with unified rules. The scope of ProDOK NG‘s functions comprehensively fulfills the requirements of I&C project engineers for the project phases of basic planning, function planning, realization planning and installation planning – whether the planning of new projects, alterations or extensionsis concerned – and provides optimal support in the operative phase. The P&ID module simplifies the project planning, documentation and administration of process-related elements in your process automation projects. Increase the quality, reliability and efficiency of your electrical engineering planning. Save time and costs at the same time. 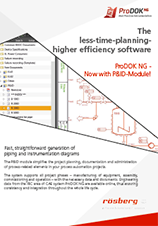 ProDOK NG electrical engineering module simplifies your planning, documentation and administration of electrical elements in process automation engineering. The system supports all project phases – manufacturing of equipment, assembly, commissioning and operation – with the necessary data and documents. The engineering data from the I&C area of CAE system ProDOK NG are available online, thus ensuring consistency and integration throughout the whole life cycle.